The variations in the relative humidity of a studio or home are generally the most important criteria in determining how often a piano needs to be tuned. Normal homes may experience fairly drastic changes from season to season. The situation is complicated by constant use which tends to deteriorate a tuning more quickly. A piano functions best under consistent conditions which are neither too wet nor dry, optimally at a temperature of 68 degrees Fahrenheit and 42 percent relative humidity. You can reduce the severity of these climatic effects by placing your piano in the room so that it is away from windows or doors which are opened frequently. Avoid heating and air conditioning vents, fireplaces and areas receiving direct sunlight. Steinway’s suggestion is to attempt to control the conditions in the room first. If the room is too large, open or otherwise difficult to control, consider installing a Dampp-Chaser humidity control system on the piano in order to get the humidity fluctuations under control. Proper placement and humidity control will go a long way towards maximizing your tunings. 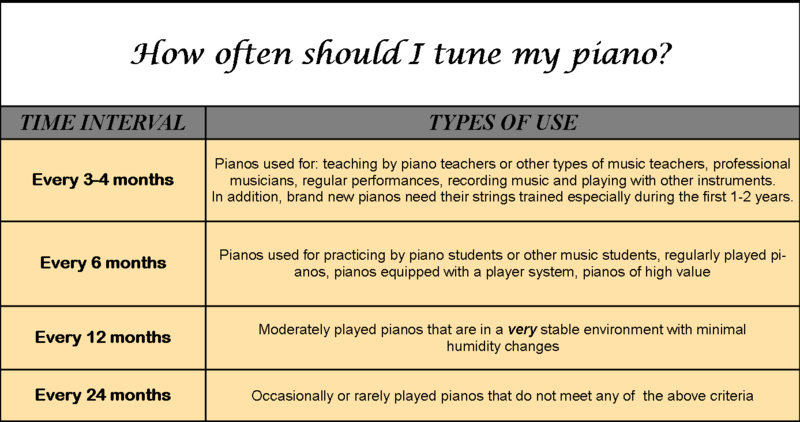 While manufacturers’ recommendations on the number of annual tunings vary, they generally agree that a piano should be tuned at least two to four times each year, with additional tunings as needed. In the teacher’s piano, because of the amount of time your piano is in use and because ear training is such an important aspect of any musical education, your piano may require more tunings annually than other pianos. Your piano may also be used to make audition tapes for student scholarship competitions where impeccable intonation is vital for your students to sound their best. In these situations it is prudent to tune whenever the piano needs to be at its best. Again, proper placement and humidity control will go a long way towards maximizing your tunings.